FARMINGDALE, N.Y. -- Roughly 12 hours after the Super Bowl ended, Matt Seelinger was debating whether Tom Brady or Bill Belichick deserved more credit for being the foundation of the Patriots' dynasty while a foam roller dug into the Rays right-hander's hamstrings. East Coast Strength and Performance (ECSP) was mostly empty because the college athletes who train there were back at school for spring semester. A few guys from independent leagues were getting in their work. Giant medicine balls smacked into walls and padded floors. Music played on loudspeakers. Ventilation hummed. Squat racks lined the walls and rows of dumbbells sat in the corner. Monday morning workouts are common for lots of prospects during the offseason, but for those taken in the 28th round, like Seelinger was in 2017, even Monday mornings after the big game are necessary. He sees this as the work that turns late-round fliers into organizational gems. Teams give their Minor Leaguers offseason goals, but it's on the player to make sure he's properly conditioned for Spring Training. "They'll call you once a month to see how you're doing, check in on you, see how your body is," Seelinger said. He continued to warm up as fellow right-hander and third-ranked Mariners prospect Justin Dunn approached. Seelinger and Dunn grew up about 15 minutes from each other -- Seelinger in Westbury and Dunn in Freeport -- and trained together last offseason at a different gym. Acquired from the Mets as part of the Robinson Cano deal, Dunn spent most of his winter in Florida and was set to report to Arizona for his first big league camp the following day. With Dunn resting before heading west, Seelinger began his own work with an oversized medicine ball. The exercise helped him feel like his upper body was leaning over his front leg by the time he was ready for a mound about 40 minutes later. The duo commented on the one-stop nature of the facility -- it's a place where players can lift, throw, hit and recover under the same roof. "It's an awesome spot here," Seelinger said. "I love it here." He wrapped power bands around his ankle for lateral movement work, his back foot perpendicular to his body and front foot pointed forward. During the season, Seelinger -- who typically pitched in the eighth and ninth innings for Class A West Virginia in the Pirates system before being traded to the Rays for Adeiny Hechavarria last Aug. 6 -- usually began his band work around the fifth or sixth inning. Over the winter, however, he does his skill work before his strength conditioning, which he said is a near impossibility during the season. He took the trade hard, especially since it came after the deadline. It was an off day for the Power, so the toughest part was not saying goodbye to his teammates. But he realized it was probably best for his career, and being dealt 1-for-1 for a Major League player is "pretty sick." He went 3-for-3 in save situations with Class A Bowling Green and posted a 2.19 ERA in eight regular-season appearances, also recording the final three outs as the Hot Rods captured their first Midwest League title. Although he turns 24 in April and has never pitched above Class A, he's not sweating his trajectory. "I just look at it as, I'm going into my second full season," he said. Naturally, Seelinger has a chip on his shoulder. Late-round Draft pick. Traded. Not the highest of expectations. He's aware dozens of players are looking to take his spot every June. "I think I will forever feel like that, until you make it to the big leagues," he said. "I don't ever want to feel settled." Unfortunately for prospects who call the Northeast home, they cannot control the weather. Despite mild temperatures outside on the day after the Super Bowl, Seelinger stuck with his routine and threw indoors. That involved heaving a weighted rubber ball against the wall, then throwing a seven-ounce ball into an L screen. He employs an over-the-top delivery and tried to mimic that motion during the exercises. To simulate long toss, Seelinger fired into the taut netting at a high angle. When that was done, he walked onto a makeshift mound. The guy who was supposed to catch Seelinger's bullpen was running late, but ECSP pitching coordinator Tyler Levine donned the tools of ignorance and crouched behind the artificial plate to keep the 6-foot, 205-pounder moving. Seelinger threw 16 warmup pitches, with Dunn watching closely. Others gathered to watch. One of the warmup pitches missed badly, prompting Dunn to joke, "There you go. Throw five straight and then drop one arm-side." Knowing that when he enters games during high-leverage situations this summer he will not have MLB.com's No. 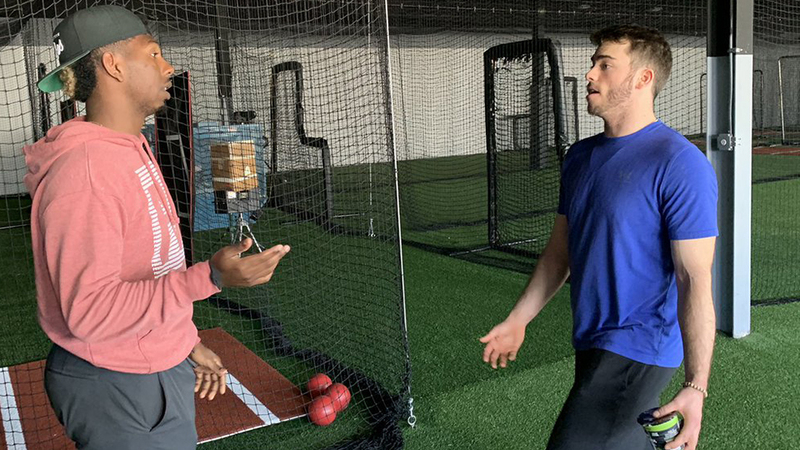 91 overall prospect giving him real-time pointers, Seelinger was careful to take advantage of Dunn's feedback, especially as he began pitching simulated at-bats. He turned to Dunn after falling behind the first hitter, 2-0. "That's what I'm working on this year, is going down and then going up," he said. "But you think three straight fastballs?" Dunn's attention was on a device set up behind home plate. "You see the little silver thing on the Trackman?" he said. "I throw that pitch up there and I let it run up. I'm basically saying, 'I don't care if this is anywhere near the strike zone.' I'm literally just trying to get him to look at this ball and take his eyes off of down, because I'm getting him out on the next pitch down. Literally throw it off the backstop for all you care. Nowhere near the zone." The next pitch was a fat one down the pipe. "That's gone. Sorry," Dunn said. "Run it back. Up higher. I mean, it might not be gone. He might take it. You have a high spin rate, so he might swing through it. Throw it over his helmet." Seelinger threw the next one high. "Perfect, perfect," Dunn said. "Now bounce it right on the plate." Seelinger unleashed his breaking pitch -- a knuckle-drop -- at the intended spot. "Perfect," Dunn said. "He's out. I would literally pitch everybody like that. You're different because your breaking ball is north-south. You can do it [against] lefties and righties. I have to go up and down different to righties than I do lefties." Two simulated batters later, Seelinger feigned facing a lefty. He started by missing up-and-in with his cutter, which is a work in progress. "I'm a big fan of doubling it up," Dunn said. "I'm big on changing eyes. If I've been showing in to lefties all day, I have to show something away to get them off of it." The two are not the same kind of pitcher, however. Dunn is a starter with a four-pitch repertoire, Seelinger a reliever with two pitches he can consistently trust. "But I'm coming out of the 'pen," Seelinger said. "It's the same [thing]. It's the same philosophy," Dunn replied. Bobby Honeyman, a Mariners infielder who trains at ECSP, chimed in. "I'm probably thinking you're throwing fastball," he said. "So I wouldn't throw a fastball." Dunn disagreed, encouraging Seelinger to try another heater. But when that offering missed low and Seelinger was tempted to throw a third straight fastball, the 2016 first-rounder cautioned against it. "That's what gets you hit," he said. "This is a situation where, I'm a four-pitch pitcher, I'm flipping a breaking ball. I'm throwing a breaking ball off his front shoulder, I'm spinning it back. … I have options out of that. I'd throw a changeup here. Right down the [middle]. Boom. Strike." Seelinger took the suggestion, throwing a changeup for a strike. "Run it back," Dunn said. Seelinger did, throwing another changeup in the zone. "Now you just slowed him down." The SUNY Farmingdale product considered throwing his knuckle-drop to finish off the hitter. "No," Dunn replied. "Changeup after breaking balls, breaking balls never after the changeup, at least for me." Seelinger fired a four-seamer to get the out, then faced one more batter. In all, he threw 24 pitches, but the knowledge gained outweighed the reps taken. Dunn was saving his bullpen for a different location later that day and said he'd be focusing on a set of checkpoints to mentally clear with each delivery. "It's more of a touch and feel," he said. "Seelinger was focused on working on hitters. I'm more worried about getting my body in the right position. Because when I get out there, it's all on me and I don't have time for people to correct me anymore. I have to be able to feel those corrections myself." The way Seelinger and the staff at ECSP see it, there are three phases to the offseason. The first is largely recuperative and runs from the end of the season through about mid-October. "They're pretty banged up," ECSP co-founder and strength coordinator Warren Kelly said. "Let's get them healthy and moving better. Let's take care of any soft-tissue stuff or any injuries." "Soft-tissue stuff" is where Mike Stella becomes paramount. He's the director of sports medicine at ECSP and a co-owner. He works on players in a large room away from the cages, nets and gym. "When the guys first get back from the season, there's a lot more getting them back to neutral that has to happen," said Stella, who also works with the righties Noah Syndergaard of the Mets and Adam Ottavino of the Yankees. Elbow contractures are among the most common issues he treats in pitchers. Other aches and pains are also rectified. During the recuperative part of the offseason, he sees guys twice a week. "My role is to help Warren evaluate these guys and find out where their deficits are, functionally, mobility-wise, and then team up so we're addressing those from both ends of the spectrum," Stella said. "The manual therapy perspective, but that's matching what they're trying to accomplish in the weight room and on the mound. So we do take more of a performance-enhancement approach in here." This work continues throughout the offseason. It's technically treatment, but there may not be an actual injury. Stella takes preventive measures with his clients, which he feels is an under-utilized tactic in orthopedics. "I think a lot of athletes are conditioned that the athletic training room is a place you don't want to go," he said. Dunn referred to Stella as not just a trainer but a "life coach." Seelinger made sure to schedule an appointment with him when he was home during last season's All-Star break. But Stella's biggest challenge is trying to erase the stigma of being treated, and he sees it changing slowly in a game based on tradition, starting with Minor Leaguers. "These aren't problems," he said. "These are opportunities we can focus on to make you a better athlete." Take, for example, his work with Seelinger. The first offseason they worked together was before his first full season in the Minors. They addressed a pair of problem areas -- his hips and upper back -- and Seelinger ultimately saw increases in his velocity, which he attributes to Stella's work in helping his mobility. Phase two of the offseason is what Kelly refers to as the "in between." For Seelinger, that includes light throwing and strength work from late October through the new year. When January begins, there's more specializing and ramping up. Kelly puts his trainees through three-week rotations -- phase three -- as the season approaches. "We're just maintaining strength here," Kelly said. Each player is given an individual assessment when he signs up. For example, when Seelinger showed up with a back injury this year, Kelly removed deadlifts and squats from his workouts and replaced them with more joint-friendly exercises. But even though players are on different programs, competition is a part of the process. Hitters rely on speed and power exercises. Pitchers cover those things, too, but workouts include more arm care. "Warren and all the guys, we've all become really good friends," Honeyman said. "I love having that type of culture. Not only being able to lift here, but then literally taking 10 steps and being able to hit in the same place is a huge advantage not lots of people have." The Rays gave Seelinger -- and their other Minor Leaguers -- the option of arriving in Florida in late January. But when he has everything he needs right at home, why leave? "I kind of don't want to go back," he said. "I want to just stay and train."